Many people approach me asking more or less the same questions: how to start RE, how to become a malware analyst, how did I started, what materials I can recommend, etc. So, in this section I will collect some hints and useful links for the beginners. The topic of reverse engineering (RE) is very broad. You can reverse engineer all sort of software for all sort of platforms. You can even reverse engineer hardware. But in this article I will focus mostly on the subset of skills that you need for analyzing malware on Windows. How to get malware samples, intelligence etc.? For a threat intelligence, information about outbreaks, hashes of fresh samples etc, I recommend you to join twitter and follow some of the researchers that you know. Reversing is an art that you can learn only by doing, so I recommend you to start practicing directly. First try to practice by following step-by-step writeups. Check also writeups from an annual FlareOn Challenge. It contains variety of reverse engineering tasks with growing difficulty level. Reversing a native application requires you to understand some low-level concepts. 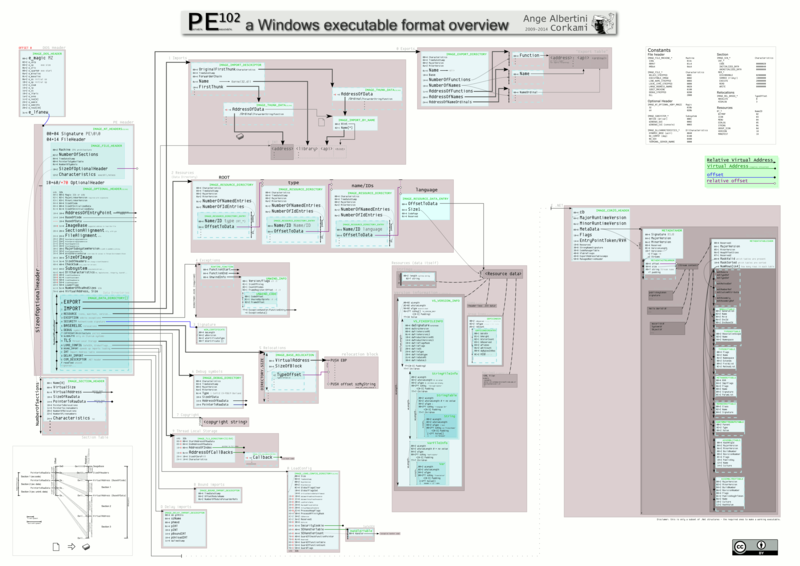 If you want to focus on Windows malware (as I do), you will most of the time be dealing with PE files. When you watch an application under a debugger, you see it in a disassembled form – transformed to assembly language (assembler). So, the more about assembler, PE structure, and operating system you know, the easier will be for you to follow. 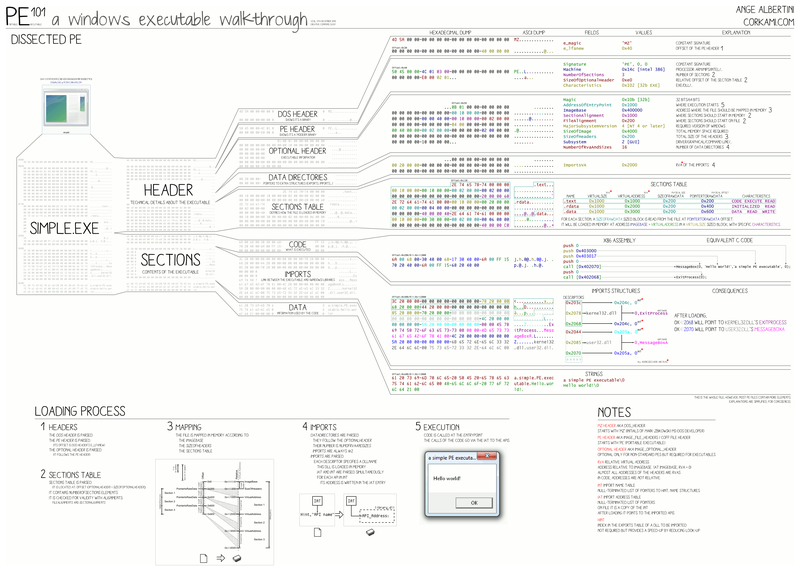 Here and here you will find some gentle introduction to x86 assembly. To get a deeper understanding and a grasp on other platforms too, check this free book. For learning the PE format, I recommend you to read related articles of Matt Pietrek (i.e. ), and Ange Albertini’s posters (PE101, PE102). Check also PE-bear and try to view various executables, compare it with what you read about the format. Not all malware analysts are proficient programmers, but you need to have some basic skills, and at least be able to understand the code. The more fluent programmer you are, the better for you – you will be able to experiment with the techniques and create some tools helping you in analysis. The languages that I use on daily are C/C++, Python, and assembler, and I am mostly agree with [this] MalwareTech’s article. Iczelion’s tutorial, Win32 Assembler for Crackers by Goppit. “Windows System Programming” is a very solid book covering Windows API and the related topics. Malware usually comes packed, and in order to analyze the core you will have to unpack it from the outer, protective layer. Malware distributors may use legitimate, well-known packers and protectors, as well as custom ones, prepared with a special focus on AV evasion. This article explains the concept. To get familiar with manual unpacking, check the series of tutorials “Unpacking With Anthracene” , and other tutorials from Tuts4You. My vidoetutorials about unpacking malware are available here. Most of the malware injects code into other processes. The common purposes of injections are: impersonating other applications and hooking. Used methods are various. The most popular is Process Hollowing (aka RunPE) and Reflective DLL injection. Hooking is a technique that allows to intercept API calls. Malware uses this technique for various purposes, such as: being unnoticed by monitoring applications, intercepting the data being sent etc. From the other hand side, the same technique is also used by sandboxes, to monitor malware. Most of the malware you will encounter works in userland. But from time to time you can come across some kernel mode malware modules. Reversing them is more difficult, and it will require different environment setup. How to get a job as malware analyst? From my experience, the best way is to contribute in the community. Be active, start researching on your own, show your passion, share what you learned. There is a big and very friendly community of researchers on twitter, it helped me a lot finding a job in this field. So, if you are not there yet, I strongly recommend you to join. 12 Responses to How to start RE/malware analysis? What are some CS classes hat help improve Reversing Skills? Hi! My setup for malware analysis is very simple. As a base system I use Linux (Debian) with Wireshark (to sniff the traffic from the guest if needed). Then I use Windows on VirtualBox. On Windows I have all my tools installed (PE-bear, debuggers, PIN tools, SysInternals Tools, Fiddler, etc). I don’t usually use hardened VMs, just a basic setup. I start from viewing a sample in PE-bear, then I am unpacking it (with PE-sieve, or manually if needed). Once I have the sample unpacked, I view it again in PE-bear, to get a general overview. If it is not obfuscated, I just open it in IDA and start analyzing statically. If the sample is complex or obfuscated, I start from tracing it by a PIN tracer. I usually use TinyTracer (https://github.com/hasherezade/tiny_tracer first), then eventually some more complex traces. They give me tags that I am loading to IDA to better understand the obfuscated parts. Depending on a sample, I can switch from static to dynamic analysis multiple times. Sometimes I may start from a behavioral analysis, observing API calls with ProcMon, observing eventual traffic with Fiddler or Wireshark. I do several iterations, renaming functions in IDA, adding comments. When the sample is defending itself against analysis, I find those branches by PIN tracers, and patch them to make the malware “blind”. Sometimes I import functions from malware to experiment with them (with libPeConv). Thankyou for sharing all of this @hasherezade !!! I came to know about you from a paper i read about PrincessLocker unpacking. Love your content and wish to contribute to the community soon! any recommended resources to learn shellcoding ?